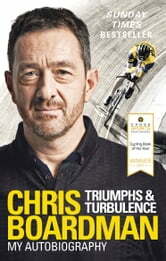 Chris Boardman is the 2017 winner of the Cross Sports Cycling Book of the Year for his autobiography Triumphs and Turbulence. You may know him as the much-loved co-presenter of ITV’s Tour de France coverage or enjoyed his BBC Olympic coverage, but beyond the easy charm Chris Boardman is one of our greatest, most inspiring cyclists. Boardman’s lone achievements in the 80s and 90s – Olympic track gold, the world hour record, repeatedly claiming the yellow jersey in the Tour de France – were the spark that started the modern era for British cycling. His endeavours both on and off the bike have made him the founding father of current golden generation – without him there would simply be no Hoy, Wiggins or Cavendish. It is a story full of intrigue: from Olympic success, to the famous duels with Graeme Obree and the insanity of the Tour de France. Chris became a legend for his combination of physical ability and technical preparation, almost single-handedly taking British cycling from wool shirts and cloth caps into the era of marginal gains. Indeed, after his career on the bike ended, a new chapter began as the backroom genius behind GB cycling. As head of the R&D team known as The Secret Squirrel Club, Chris has been responsible for the technical innovations that made the difference in 2012 and developed Boardman Bikes, which has become the country's bestselling premium bike range.